Scott Wingate joined the WAVE Foundation team as the Executive Director in May 2015 and is excited about the opportunity to create social change through education, conservation and volunteerism. He earned his B.A. in Biology from Ohio State University and earned his M.A. in Biology from Miami University. Scott has spent much of his professional career working with the Cincinnati Zoo & Botanical Garden; managing their Education and Visitor Experience departments. While at the Cincinnati Zoo, Scott led strategic planning efforts, organizational development initiatives, and global conservation projects. He taught a variety of conservation-focused graduate courses for Miami University and led graduate students on trips to Namibia and Kenya’s South Rift Valley. As the Executive Director, Scott recognizes that wildlife conservation is not a wildlife problem-it is a people problem. During his free time Scott enjoys spending time on his boat with his lovely wife, Jenna and their two dogs, Apache and Tex. Jenny Greber is the Manager of Volunteer & Intern Services for the WAVE Foundation at the Newport Aquarium. She has her undergraduate at University of Cincinnati College of Arts and Sciences and was one of the first people in Cincinnati to obtain her Certificate of Volunteer Administration in 2006. Jenny started her career in volunteering back when she was a girl scout and ran Youth Retreats in high school. She has been in Volunteer Management for over 25 years and is a mentor in the field. Jenny was on the Board for CAVA (Cincinnati Association for Volunteer Administrators) from 2000 – 2009 and was President from 2007-2009. She currently is Vice-Chair for the Volunteer Manager Committee for Association of Zoos and Aquariums. Jenny joined the Newport Aquarium in July of 1999 and created the Volunteer & Intern Services from scratch. We went from 1 volunteer to over 500 volunteers! Erin Shultz is the Conservation Education Manager for the WAVE Foundation. She earned her bachelor’s degree in biology from Central Michigan University. After graduation she participated in the internship programs then worked as the Overnight Adventure Program supervisor and educator with WAVE. Since that time she has ventured to the East Coast living in Connecticut as an AmeriCorps member focused on providing access to marine science and ocean adventure sports to students in underserved schools. Living in Maine next brought her to the ocean’s edge (a place she has loved since childhood) with an opportunity to provide ecology based, outdoor education to school groups from around New England. Marine science education and a love of nature are passions Erin works to share with the community. Lauren Beatty is the Education Coordinator for WAVE Foundation. Lauren earned her B.A. in Anthropology from Georgia State University focusing on archaeology and cultural studies, and began her career at Cincinnati Museum Center in 2013 in the Museum of Natural History & Science. Joining the Cincinnati Zoo & Botanical Garden as a part time educator changed the course of her career when she discovered her true purpose in inspiring people to conserve wild life. To follow that dream, Lauren took on the role of Senior Environmental Educator at Georgia Aquarium, soaking in all she could before joining WAVE Foundation at Newport Aquarium. An educator with eight years of experience, Lauren has also served as public relations chair for the Greater Cincinnati Earth Coalition, become certified as a Cincinnati Tourism Ambassador, and joined the National Association for Interpretation. Lauren is dedicated to connecting people to animals and empowering them with tools to make a difference. In her free time, Lauren enjoys running for Children’s Miracle Network Hospitals, leading brewery tours of Over the Rhine, and spending time with her family- including a dog, 2 cats, and 2 snakes! Julie Uffman is the Development Coordinator for the WAVE Foundation. 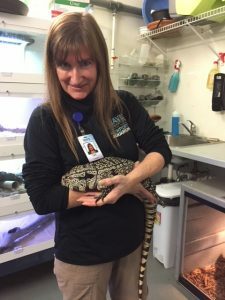 She began working at Newport Aquarium in the Guest Services department just prior to opening day in 1999. In fact, Julie sold the very first ticket to Newport Aquarium to the mayor! During her time in Guest Services, Julie served as the Guest Services Manager and was responsible for hiring and training staff working in Admissions and Exhibits. In 2005, Julie cut back to part-time so she could be at home with her children and began working for the WAVE Foundation. When she first started in WAVE, Julie was the Education Curator and was vital in the start-up of the Finstitute Classroom Programs as well as summer camp. Julie currently serves as the Development Coordinator and has a variety of jobs, including event planning, donor relations, website updates and maintaining WAVE’s finances. In her spare time, Julie enjoys spending time with her husband Mike and two daughters, Kailtyn and Lauren and is highly involved in activities at church and school. Julie holds a bachelor’s degree in Science from Ohio University and a Master’s Degree in Education from Xavier University. 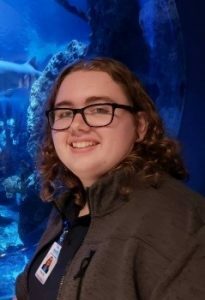 Daniel Martin has been with the Newport Aquarium and the WAVE Foundation for eight and a half years, first as a volunteer and currently as an employee. During his time here he has been a summer camp counselor, exhibit interpreter, husbandry volunteer, overnight adventure counselor, and conservation educator. Daniel is currently earning a B.S. 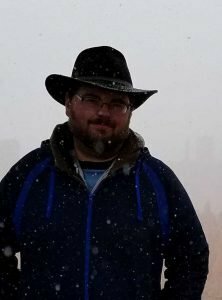 in Geology from Northern Kentucky University and has completed mapping and archaeological work in several Kentucky caves, including Mammoth Cave. Last summer he took part in a mapping project in the Colorado Rocky Mountains and a dinosaur dig in Utah. I am studying at Thomas More College to obtain a B.A. in Biology focusing on Marine Biology and an Associate’s degree in Psychology. Before transferring to Thomas More, I was an Ecology major at the University of Louisville where I was part of a research team learning about the small-scale migration of cave salamanders. I started working at the aquarium in 2015 in the gift shop and then began an internship with the education department in 2016. In 2017 I was hired as a Conservation Educator. I am also an overnight counselor and will be taking part in a husbandry internship. My favorite part of my job is seeing how excited people are to learn about and interact with our ambassador species. When I am not at school or work, I enjoy reading ecology and environmental research articles, spending time with my friends, family, and bearded dragon, scuba diving in local quarries, and hiking! Grace Kahmann is a Conservation Educator for the WAVE Foundation. She is a student at Thomas More College and is currently completing her undergraduate as a duel major in biology (on the marine bio track) and education. Grace began her career in education working as an Environmental Educator at the Thomas More College Biology Field Station. She began her career with WAVE as an outreach volunteer. She was an intern for the education department in the fall of 2017 and officially joined the team in January of 2018. Grace enjoys painting, swimming, and has a passion for conservation. It is her goal for each presentation to ease the fears and concerns many people have about marine life and eliminate the common misconceptions concerning these organisms such as sharks. She loves inspiring people to do what they can and realize that they are able to help save the world. 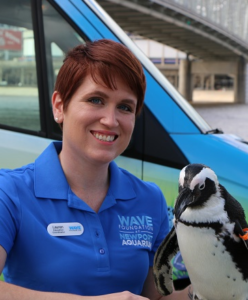 Sarah Wainscott is a Conservation Educator for the WAVE Foundation at Newport Aquarium. Sarah began her career with WAVE as an education intern in the spring of 2018. She is a graduate student at Miami University’s Project Dragonfly pursuing a master’s degree in biology. Sarah is focusing her studies on advocating for behavior changes that support conservation and are attainable by all people. Her goal is to enable people After graduating from The Ohio State University with a bachelor’s degree in zoology, she began her career in conservation education at Newport Aquarium as a Guest Experience Specialist. She enjoys reading, crochet, and gardening. Ryan’s hometown is Cambridge, OH. He is a graduate of Muskingum University in New Concord, OH, with a Bachelor of Science in Geology and a minor in Biology. Ryan is interested in attending Maine University for a Master’s Degree in Marine Biology. His favorite hobbies are scuba diving and watching movies. Teri A. Jacobs is a professionally published dark-fantasy/horror author and assistant adjunct professor at the University of Cincinnati, where she earned her doctorate in environmental geography and specialization in conservation biogeography. She has served as a volunteer and intern for WAVE Foundation since autumn 2017, and won an award for her role in co-developing the preschool program and writing the interactive storybooks starring WAVE’s ambassador animals! She endeavors to make WAVEs, to make a difference! 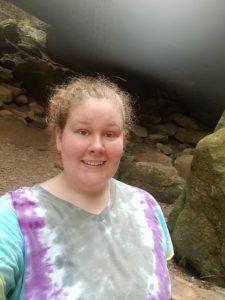 J Besides writing, teaching, and hoping to inspire others to protect the planet and all life on it, Teri loves hiking, backpacking, camping in a hammock, kayaking, archery, hang-gliding, snorkeling, rock polishing, gardening, cooking/baking, reading, playing board games, and continually learning. Her favorite terrestrial animal is the wolf and favorite marine animal is the Orca (aka the wolf of the sea). But, her familiar is a cat, of course. Rachel Cahall is currently an Americorp Public Ally serving WAVE as a Conservation Educator. She has a degree in Women and Gender Studies a thematic sequence in Critical Youth Studies from Miami University. Prior to Public Allies, Rachel has worked for Wal-Mart for five years as a cashier, and was an intern with Susan G. Komen Southwest Ohio for over a year. She is excited to educate the students of Cincinnati on the importance of conservation. Rachel hopes to continue a career working with Greater Cincinnati non-profits as an outreach and education coordinator. Rachel loves spending her free time with her two dogs, Molly and Roby.